These are the Idea Hunters. Such people do not buy into the starry-eyed notion that the only great idea is a pristinely original one. They know better. They understand that high-value ideas are already out there, waiting to be spotted and then shaped into an innovation. The authors present an eclectic band of Idea Hunters, ranging from Thomas Edison, Mary Kay Ash, and Walt Disney, to Warren Buffett and Apple’s Phil Schiller, as well as others including the leaders of Twitter, Pixar Animation Studios, and the Boston Beer Company. These people have certain characteristics embodied in the four I-D-E-A principles (Interested, Diverse, Exercised, Agile). They also know their gig—their personal mission and why it matters. They don’t let the organization, job, industry, or profession define their Idea Hunt. And they recognize how the world around them connects with their plans and projects. 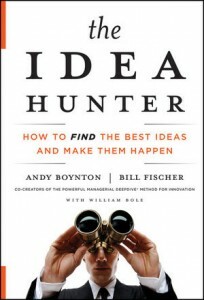 Step by step, The Idea Hunter unveils a strategy for unearthing new ideas in any industry or organization. Ron Sargent, Chairman & CEO, Staples, Inc.